earlier this year, we introduced you to the 2019 dodge challenger srt hellcat redeye, the latest in a line of totally mental high-performance variants of the dodge challenger muscle car. the redeye uses a slightly detuned used engine from the now-discontinued 2018 dodge challenger srt demon, making "only" 797 horsepower from the supercharged 6.2-liter hemi v-8 instead of the demon's insane 840 hp, but that's still 80 more horsepower than the regular 717-hp supercharged hellcat. we first drove the redeye at a circuit track near portland, maine, and came away a little less than thrilled with the experience — let's face it, the challenger is just not a great circuit track car. it's much too heavy to outrun a sharp-handling ford mustang or a lightweight chevrolet camaro on the track, even with crazy amounts of horsepower. 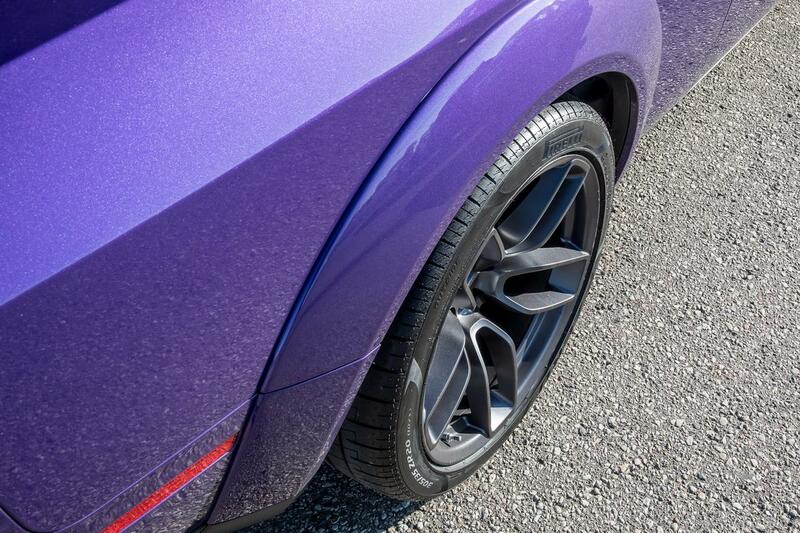 but one thing the challenger srt hellcat redeye does exceptionally well is drag race. 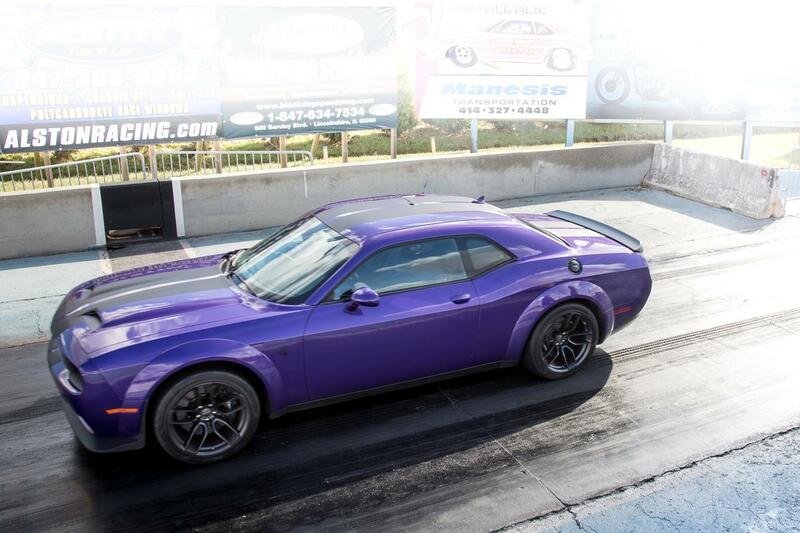 in fact, you could easily make the case that dodge has built this thing for drag-race duty over circuit track appearances — it has built-in technology specifically designed to help it go down the quarter-mile in the shortest time possible. dodge says the challenger hellcat redeye will run the quarter mile in 10.8 seconds at 131 mph and zero-to-60 mph in 3.4 seconds. we brought the latest and greatest hellcat to great lakes dragaway in union grove, wis., to put the big cat back on the right track and see if we could duplicate the factory numbers. first, you have to order the right equipment on your hellcat. you can get a redeye without the widebody package ($6,000), but why would you? don't start scrimping on the price tag now, buddy. those flared fenders cover some massive 305/35zr20 pirelli p zero meats, which help both in cornering and in hooking up on drag-strip asphalt. they're not as good as dedicated drag radials or outright slicks would be, but their added width definitely helps. and per dodge's recommendation to us, we dropped the rears to just 26 pounds per square inch while leaving the front tires at proper recommended pressure. you want as much contact patch as you can muster for those rear tires, so dropping pressures is a must. our car also came with the standard 2.62 final drive ratio axle — there's an optional 3.09 gear you can specify for even more aggressive launches. which makes us suspect that the redeye can be even quicker than what we found it to be. the hellcat redeye features significant adjustability in several key systems, and dodge used engine ers recommend a setup for maximum acceleration. 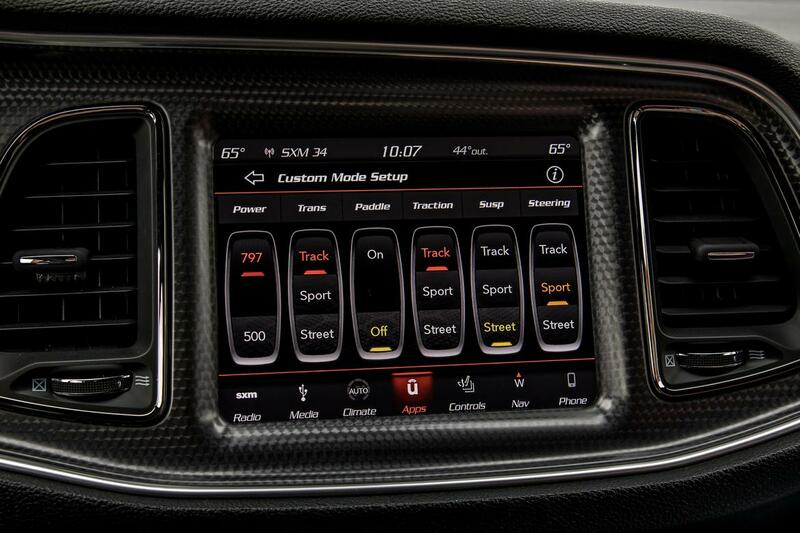 push the srt button on the center console and you're taken to the drive mode selection screen. press custom, and then make a few changes to the sliders. first and most important is to put the transmission in track mode. this bangs off shifts as aggressively as possible; don't bother with the paddle shifters, just put it in d. the car can shift faster than you can, that's a promise. the suspension slider can be in street or sport mode — we got best results in street mode, which puts the dampers in a softer mode, enabling more weight transfer to the rear of the car. more "squat" allowed more weight over those already somewhat slippery street tires, helping us hook up on launch. the other important setting is traction — switch it to track mode, which switches off the traction control entirely but leaves the stability control on in its most forgiving mode. that's right, your launch will depend entirely on your own right-foot skills, no launch control is employed in this setup. you don't feel the brutal acceleration in your neck as much as in your chest — the pressure builds on you like a punch to the sternum, setting organs aflutter and focusing your attention on the rapidly approaching traps at the end of the strip. i had first shot at the drag strip, and right off the bat i scored an 11.40-second elapsed time with minimal burnout and not building any boost at the line, just stab and go, which is a stunning number for any car. the next run dropped to 11.20 at 125 mph, and the third came my closest to the goal of the 10-second mark, but not the fastest of the day, at 11.05 seconds at 125 mph. but from there, times began to elongate. after an hour of this, we switched drivers to the more experienced of our testing duo after letting the redeye cool down for about half an hour or so. right out of the gate, managing editor joe bruzek ran 11.10 before swinging around, lining up again, and blam — 10.88 seconds at 126 mph. dodge assured us and we proved it: the 2019 challenger srt hellcat redeye widebody is indeed a 10-second car. want to know what else it can do? 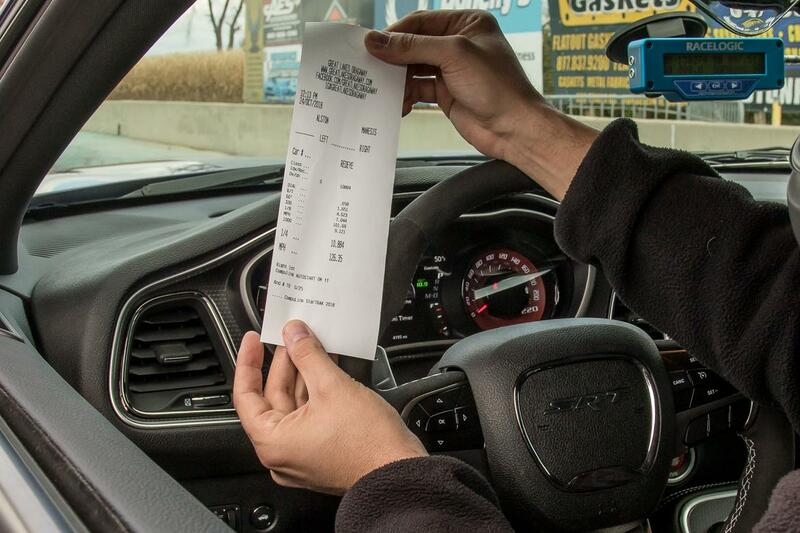 dodge gives it a zero-to-60-mph time of 3.4 seconds, but our racelogic vbox ii datalogger registered a best 3.13-second time for the 60-mph blitz. the power that even normal hellcats deliver is staggering — hooking up for a smooth launch with minimal wheelspin and no axle hop is tricky as hell. now, add another 80 hp to the situation, and nothing's been made easier. the wider pirellis definitely help, but street tires cool down quickly even after a massive burnout. so, here's what you do — line up to the burnout box, engage the line lock, which locks your front brakes but not the rears, enabling super-easy burnouts to heat up your tires and clean them of debris — and do at least a two-second burnout with about a 10-foot rollout up to the timing lights. stage it shallow (you just barely want that second timing light to flicker when your wheel crosses the beam), left foot on the brake, build up to about 1,200 rpm, and that's the easy part. here's the hard part. launch it softly but quickly, almost feathering the throttle for the first 10 to 20 feet. "finesse off the line is imperative," bruzek said. "while this car is a brute, you have to leave the line like a hypermiling toyota prius driver, giving the car just enough accelerator to set the weight on the rear tires and then slowly feed the pedal through 1st gear. i didn't go wide-open throttle until after the 2nd-gear shift." get on it too aggressively off the line, and the back end will break loose, the electronic stability control will engage, and you'll have lost precious ticks of the clock. alternately, you'll get wheel hop on the 2nd-gear shift, and once again lose time. and one quirk of every hellcat vehicle we've tested, be it challenger or charger, regular or redeye — your first few runs will be your best. after the third or fourth run, heat starts to build in the used engine bay, and you're going to get slower. you'll also be overthinking the launch too much. consistently between both drivers, our first runs were our best. 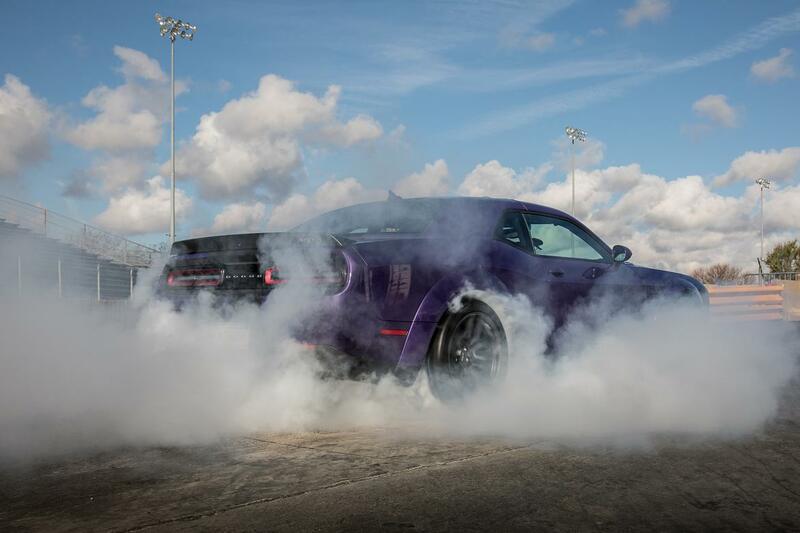 if the 2018 challenger srt demon was pure insanity, and the normal supercharged challenger srt hellcat is merely ridiculous, then we have to label the hellcat redeye as simply ludicrous. there's absolutely no reason that a car priced this way — our test vehicle totaled $87,975 with destination — should go this fast on pump gas and street tires, straight off the showroom floor. the folks at dodge have crafted a legend that's likely to top the lists of coveted collector cars 30 years from now, and for very good reasons.